After attending the Ecole Polytechnique in Paris, the Ecole Nationale du Génie Rural and working as an engineer for a few years, I did a PhD on the cell cycle regulation of phytoplankton with Penny Chisholm at MIT, Cambridge, US. Since 1985, I have a researcher at CNRS, working at the Station Biologique of Roscoff (France). I initially developed applications of flow cytometry to measure picoplankton abundance in the Ocean. I then focused on the diversity and ecology of eukaryotic picophytoplankton developing molecular approaches such as gene cloning, metabarcoding and metagenomics. Currently my interests revolve around green algae, bolidophytes and haptophytes involved in symbioses with cyanobacteria. I have also a keen interest in data processing and data analysis of metabarcoding using especially R. I created in 1998 the Roscoff Culture Collection, which is now the biggest collection in the world for marine phytoplankton. I am currently spending one year at Nanyang Technological University in Singapore as a visiting Professor. Diversity and oceanic distribution of marine phytoplankton, in particular green algae and Bolidophyceae. Analysis of marine eukaryotic communities using metabarcoding (nuclear 18S rRNA, plastid 16S rRN), especially on populations sorted by flow cytometry. Polar picoplankton communities and their adaptation to the long winter polar night. Phytoplankton survival in the polar night. 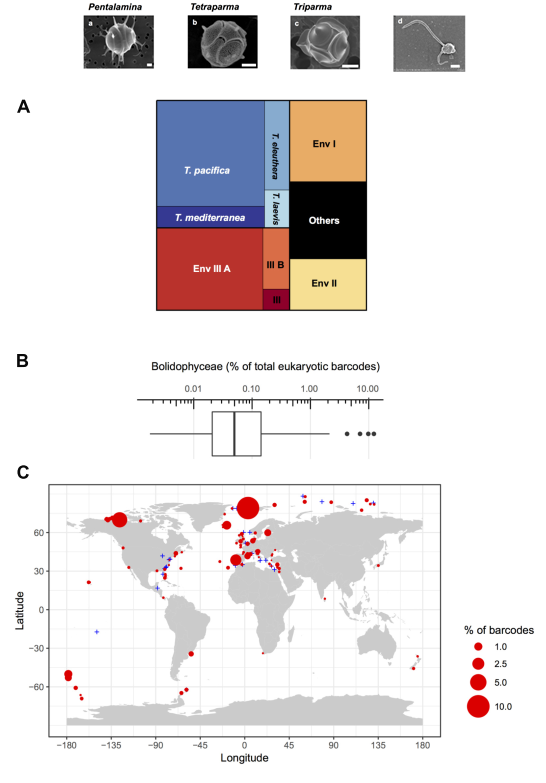 A seven-year study in the Bay of Banyuls (North Western Mediterranean Sea) shows that despite some fluctuating environmental conditions, many microbial taxa displayed significant yearly rhythms. We used DNA metabarcoding of the 18S rRNA gene and particle interceptor traps (PITs) to characterize the taxonomic composition of particles sinking out of the photic layer in the California Current Ecosystem (CCE), a productive system with high export potential. 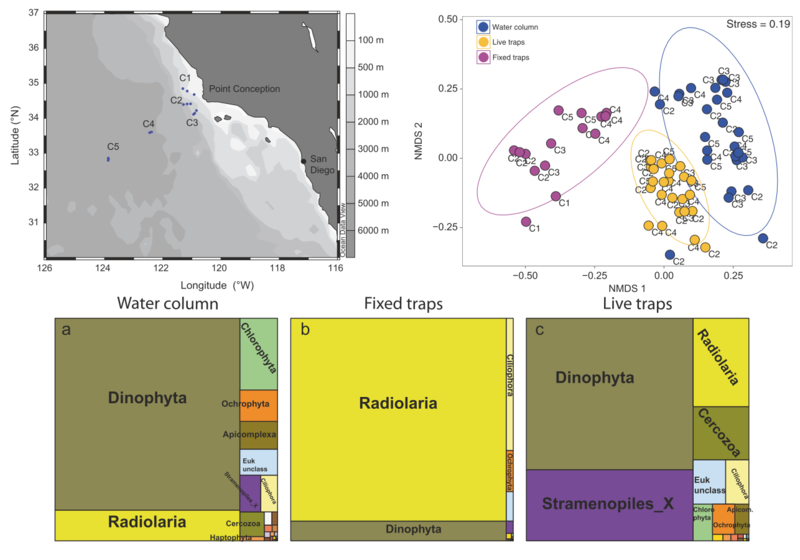 Sequences affiliated with Radiolaria dominated the eukaryotic assemblage in fixed traps (90%), with Dinophyta and Metazoa making minor contributions. The prominence of Radiolaria decreased drastically in live traps, possibly due to selective consumption by copepods, heterotrophic nanoflagellates, and phaeodarians that were heavily enriched in these traps. Our findings identify Radiolaria as major actors in export fluxes in the CCE. Bolidophyceae contains species with cells surrounded by 5 or 8 silica plates (Parmales) as well as naked flagellated species (formerly Bolidomonadales). Bolidophyceae share a common ancestor with diatoms. This review summarizes the current information on taxonomy, phylogeny, ecology, and physiology. We describe RCC1774, a strain isolated from the foreshore near Roscoff (France). It is phylogenetically related to members of the Acaryochloris genus but completely lacks Chl d. Instead, it possesses monovinyl-Chl a and b at a b/a molar ratio of 0.16, similar to that in Prochloron and Prochlorothrix. It differs from the latter by the presence of phycocyanin and a vestigial allophycocyanin energetically coupled to photosystems. Its very unusual pigment content compared to other Acaryochloris spp. is likely related to its specific lifestyle. Frédéric Partensky, Christophe Six, Morgane Ratin, Laurence Garczarek, Daniel Vaulot, Théophile Grebert, Dominique Marie, Priscillia Gourvil, Ian Probert, Sophie Le Panse, et al. Symbioses between eukaryotic algae and nitrogen-fixing cyanobacteria have been recognized in recent years as a key source of new nitrogen in the oceans. We investigated the composition of the small photosynthetic eukaryote communities associated with nitrogen-fixing cyanobacteria in the Brazilian South Atlantic Bight using a combination of flow cytometry sorting and high throughput sequencing of two genes: the V4 region of 18S rRNA and nifH. Rowena Stern, Alexandra Kraberg, Eileen Bresnan, Wiebe H.C.F. Kooistra, Connie Lovejoy, Marina Montresor, Xose Anxelu G. Moran, Fabrice Not, Rafael Salas, Raffaele Siano, Daniel Vaulot, Linda Amaral-Zettler, Adriana Zingone, Katja Metfies. Can molecular tools enhance long-term monitoring of marine protists?. Journal of Plankton Research, in press, 2018. Margot Tragin, Daniel Vaulot. Green microalgae in marine coastal waters : The Ocean Sampling Day (OSD) dataset. Scientific reports, 8:14020, 2018. Margot Tragin, Adriana Zingone, Daniel Vaulot. Comparison of coastal phytoplankton composition estimated from the V4 and V9 regions of the 18S rRNA gene with a focus on photosynthetic groups and especially Chlorophyta. Environmental Microbiology, (20), 2, pp. 506–520, https://doi.org/10.1111/1462-2920.13952, 2018. Solenn Mordret, Roberta Piredda, Daniel Vaulot, Marina Montresor, Wiebe H. C. F. Kooistra, Diana Sarno. 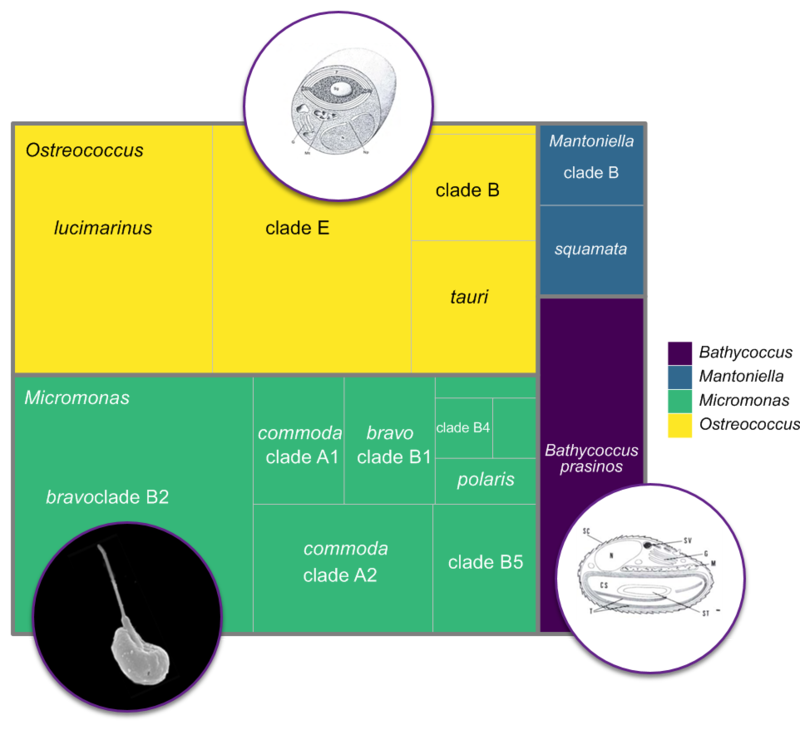 DINOREF : A curated dinoflagellate (Dinophyceae) reference database for the 18S rRNA gene. Molecular Ecology Resources, 18, 974-987, https://doi.org/10.1111/1755-0998.12781, 2018. Nathalie Simon, Elodie Foulon, Daphne Grulois, Christophe Six, Yves Desdevises, Marie Latimier, Florence Le Gall, Margot Tragin, Aude Houdan, Evelyne Derelle, Fabien Jouenne, Dominique Marie, Sophie Le Panse, Daniel Vaulot, Birger Marin. Revision of the Genus Micromonas Manton et Parke (Chlorophyta, Mamiellophyceae), of the Type Species M. pusilla (Butcher) Manton & Parke and of the Species M. commoda van Baren, Bachy and Worden and Description of Two New Species Based on the Genetic and Phenotypic Characterization of Cultured Isolates. Protist, (168), 5, pp. 612–635, https://doi.org/10.1016/j.protis.2017.09.002, 2017. Adriana Lopes dos Santos, Thibaut Pollina, Priscillia Gourvil, Erwan Corre, Dominique Marie, Jose Luis Garrido, Francisco Rodriguez, Mary-Helene Noel, Daniel Vaulot, Wenche Eikrem. 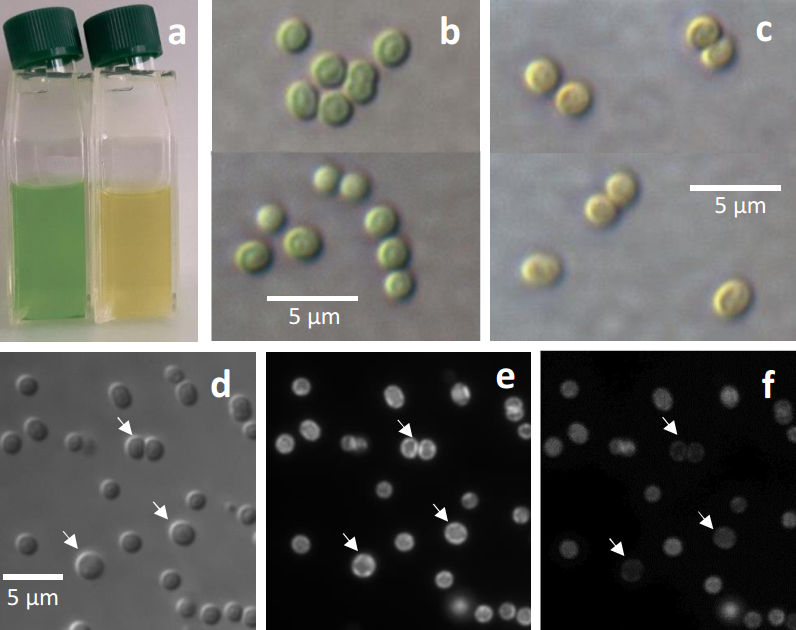 Chloropicophyceae, a new class of picophytoplanktonic prasinophytes. Scientific Reports, (7), 1, pp. 14019, https://doi.org/10.1038/s41598-017-12412-5, 2017. Adriana Lopes dos Santos, Priscillia Gourvil, Margot Tragin, Mary-Helene Noel, Johan Decelle, Sarah Romac, Daniel Vaulot. Diversity and oceanic distribution of prasinophytes clade VII, the dominant group of green algae in oceanic waters. 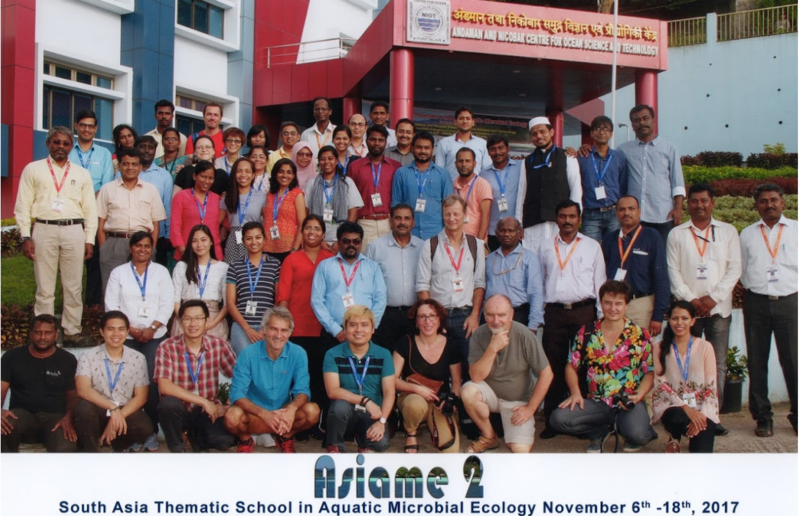 The ISME Journal, (11), 2, pp. 512–528, https://doi.org/10.1038/ismej.2016.120, 2017. Dominique Marie, Florence Le Gall, Roseline Edern, Priscillia Gourvil, Daniel Vaulot. Improvement of phytoplankton culture isolation using single cell sorting by flow cytometry. Journal of Phycology, (53), 2, pp. 271–282, https://doi.org/10.1111/jpy.12495, 2017. Sergio Balzano, Isabella Percopo, Raffaele Siano, Priscillia Gourvil, Mélanie Chanoine, Dominique Marie, Daniel Vaulot, Diana Sarno. Morphological and genetic diversity of Beaufort Sea diatoms with high contributions from the Chaetoceros neogracilis species complex. Journal of Phycology, (53), 1, pp. 161–187, https://doi.org/10.1111/jpy.12489, 2017. Claudia Egas, Carlos Henriquez-Castillo, Nathalie Delherbe, Ernesto Molina, Adriana Lopes Dos Santos, Paris Lavin, Rodrigo De La Iglesia, Daniel Vaulot, Nicole Trefault. Short timescale dynamics of phytoplankton in Fildes Bay, Antarctica. Antarctic Science, (29), 3, pp. 217–228, https://doi.org/10.1017/S0954102016000699, 2017. Sheree Yau, Adriana Lopes dos Santos, Wenche Eikrem, Catherine Gérikas Ribeiro, Priscillia Gourvil, Marie-Line Escande, Sergio Balzano, Hervé Moreau, Daniel Vaulot. Mantoniella beaufortii and Mantoniella baffinensis sp. nov. (Mamiellales, Mamiellophyceae), two new green algal species from the high Arctic. Journal of Phycology (submitted), 2018. Karoline Magalhaes, Daniel Vaulot, Mariana Cabral de Oliveira. Hemiselmis aquamarina sp . nov . (Cryptomonadales , Cryptophyceae), a cryptomonad with a novel phycobiliprotein type (Cr-PC 564). Protist, (submitted), 2018. Ana Maria Cabello, Ramiro Logares, Raquel Rodriguez-Martinez, Sarah Romac, Daniel Vaulot, Ramon Massana. Pelagophyte assemblages of the global ocean display low intraspecific diversity. Environmental Microbiology, (submitted), 2018.